The people of Nepal have been saddened by the deaths of several civilians, security personnel and even an infant in different parts of the country. This senseless violence and loss of lives in Nepal can be attributed to a hasty drafting of a new constitution and demarcation of federal states without consultation with all stakeholders. 18 people have lost their lives so far among which 12 are civilians and 6 are police personnel. The level of violence and the number of deaths is approaching that incurred during the Jana Andolan (Peoples’ Revolution) in 2006 that ousted King Gyanendra. A total of 25 people were killed during that revolution. Why Are Madhesis and Tharus Protesting? Every Nepali with a conscience is forced to think, “Why is this violence happening?” Many also attribute this violence primarily to the protests by Madhesis and Tharus, whose demands are allegedly unjustified. As a Madhesi, I was also forced to think, “What the hell do Madhesis and Tharus want? Why are Madhesis turning out in thousands on the streets to protest and call for strikes?” Some Nepalis of hilly origin have accused India for fueling this instability. Others have insinuated that Madhesis are lured by financial incentives, primarily in the hopes of receiving 50 lakh rupees (5 million rupees) if they die during the protests. While I will not deny that 50 lakhs is a tempting sum, I find it difficult to believe that any sane human being would want to die in the hopes of receiving a lucrative posthumous sum. More importantly, this accusation is not true. Hifajat Miya, one of the Madhesis who was killed in Parsa district on August 31 by Nepal Police received a meagre sum of 15,000 rupees by a Madhesi political party to cover funeral expenses since his family was unable to do so. You do the math, that is 0.03% of 50 lakhs. What do Madhesis and Tharus Want? Money may be an incentive but there is a stronger incentive that drives thousands of Madhesis and Tharus to the streets and that is: to demand equal rights in the constitution and demarcation of federal states that abide prior agreements. This is a key fact that is missed in most of the media reports. The reports are rife about protests, strikes, ‘jhadaps’, ‘lathi charge’ and so on but fail to clearly dictate what do Madhesis want and why they are protesting. Since several years, Madhesis and Tharus have been advocating for a separate state for themselves. This is sometimes seen by people of hilly origin as a divisive act. They fear that Madhesis and Tharus would then subsequently want to separate from Nepal and perhaps annex to India. This fear is unfounded. Because India would have no interest in these regions. Regions in state 2 and 5 have among the lowest Human Development Index (HDI). Similarly, among the 20 districts with the highest per capita income, only two fall in state 2 and only one in state 5 (see our analysis). These states also lack any major hydroelectric power generation plant. In short, these two states are poor in human development, economic development and energy resources. Agriculture is the only strength of these regions. A common question is: “We have seven states now, instead of six so, why are Madhesis and Tharus still protesting? What do they want?” See the federal map below that shows proposed seven federal states. Madhesis are populous in state 2 (brown color) and Tharus in State 5 (light blue). Continuation of State 2 and 5 through Chitwan and Nawalparasi. State 2 and 5 should remain joined. The map with 14 federal states is shown below. 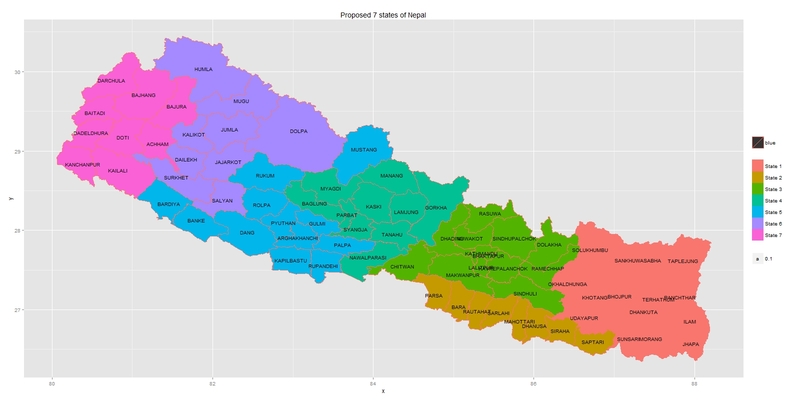 It may surprise you to note that Jhapa, Sunsari, and Morang were included in Madhesh (State 2 as in 2015 map). Similarly, Kailali and Kanchanpur was included in Tharuwan (State 5 as in 20115 map). If this was agreed and passed in 2010 by Constituent Assembly, supported by UML then why was the map changed in 2015 that has stirred Madhesis and Tharus? A notable journalist, Prashant Jha, has written extensively about the reason behind this gerrymandering. Figure 2: 11 Federal States proposed by State Reconstruction Commission. Notice how Madhesh and Tharuwan have their own states and more importantly, it includes only regions consisting of flat plains and remain joined. Unlike the federal maps of 2015, this map was not carved out in silo by just one political party or Madhesis or Tharus or Limbuwans or Khambuwans or Magars. It was decided by an eight-member State Restructuring Commission (SRC) that was formed by major parties to recommend the Constituent Assembly (CA) a best possible model to federalize the country. The eight members in the commission were Malla K Sundar and Stella Tamang from the UCPN (Maoist), Ramesh Dhungel and Sabitri Thapa from the Nepali Congress, Bhogendra Jha and Sarbaraj Khadka from CPN (UML), and Krishna Hachhethu and Surendra Mahato from SLMM – the Madhesi Morcha. It was the best chance Nepal had to formulate a federalism model that was inclusive and acceptable to most of the people. Have Madhesis and Tharus Gone Crazy or is the NC and UML leaders? This brings us to the question: who is to blame for the recent senseless violence in Nepal? Most of the Nepali media has blamed the strikes imposed by Madhesis and Tharus for worsening of the situation. Why is the Nepali media and Nepalis of hilly origin demonizing Madhesis and Tharus for demanding what had already been agreed by Constituent Assembly, supported by NC and UML in 2010 and 2012? The Nepali media has failed to mention or ask why Nepali Congress (NC) and UML backtracked from previous agreements and decided to engage in gerrymandering the boundaries of federal states in Madhesh and Tharuwan at the behest of their leaders, namely Sher Bahadur Deuba and KP Oli. This is a key question Nepali media and people have failed to ask NC and UML. This is the main reason why Madhesis and Tharus were forced to agitate yet again. Bamdev Gautam, the notorious UML home and defence minister abused his power to instruct Nepal Police to use excessive force against Madhesis and Tharu protesters. This further escalated the situation and resulted in unfortunate incidents in Tikapur, Parsa, and Kailali where civilians and policemen lost their lives. Gautam’s bold accusation that this movement is fueled by India and infiltrators from the South clearly demonstrates his racist attitudes and has served to act as an ethnic wedge to divide members of Pahadi and Madhesi communities. The human rights violations against Madhesis and Tharus is appalling and this was the primary motivation for me to write this article. I care little for politics but when civilians start dying at the hands of those who are meant to protect them, it spreads fear and instability. The rule of law breaks down and the whole nation is pushed into chaos. One cannot help but wonder whether the leaders of ruling parties, NC and UML, are treating Madhesis and Tharus as second-class citizens by ignoring previous agreements, instructing Nepal Police to open fire at dissenting protesters, and dismissing their struggle as an Indian ploy? 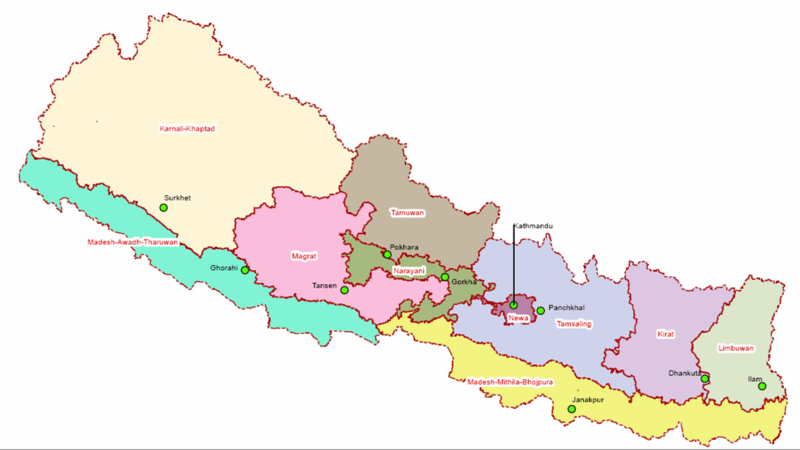 If NC and UML had any intention of creating an inclusive federal map, they could do that easily by following previous recommendations. 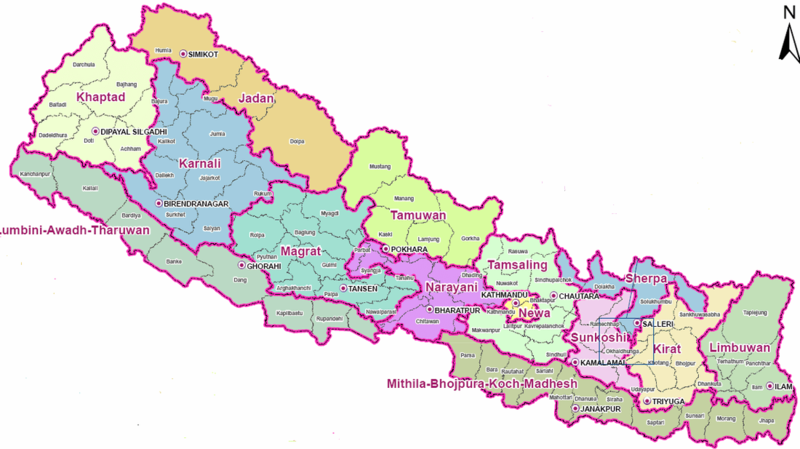 By simply adding another state – state 8, that separates Tharuwan from rest of state 5 and includes Kailali and Kanchanpur would end the protests by Tharus. Similarly, by including Jhapa, Sunsari, and Morang to State 2 would end the protests by Madhesis. The number of federal states would be still far less than 11 or 14 and their boundaries would be consistent with those proposed and agreed by them in 2010 and 2012. If the ruling political parties, NC and UML, are unwilling to listen to the legitimate demands, what options do Madhesis and Tharus? How many more Tikapur and Kailali incidents will it take before this senseless violence will end? Only NC and UML have answers to these simple but dismal questions.